From 31 October to 4 November 2016, the staff of the Faculty of Civil Engineering, Transport Engineering and Architecture of the University of Maribor—Stanislav Božičnik (the Head of the Department of Technology and Organization of Transport and the Head of the Transport Economics Centre), Borut Macuh (the Deputy Dean for Academic Affairs), Matjaž Šraml (the Deputy Dean for International and Inter-university Cooperation) and Matej Moharić (a faculty delegation member)—took part in the 44th “Education and Career” International Fair in Moscow. During the working visit, they met with the staff of the Russian University of Peoples’ Friendship. From 27 to 29 October 2016, Stanislav Božičnik participated in the presentation of “Education in Slovenia — Possibilities and Priorities”, which was held under the patronage of the Honorary Consul of the Republic of Slovenia in cooperation with the Education Committee of the St. Petersburg Mayor’s Office. The event was held in the Radisson Blue Hotel conference room. The presentation was attended by about 50 representatives of universities, secondary schools, colleges, institutes and companies specializing in the education of Russian students abroad. The Faculty of Civil Engineering, Transport Engineering and Architecture of the University of Maribor carried out its own presentation. Visitors of the Fair showed a genuine interest in this event. Particular attention was paid to the verification of diplomas, tuition fees, living expenses, and content of academic programs. The presentation of the University of Maribor and the Faculty of Civil Engineering, Transport Engineering and Architecture was also held at the College of Architecture and Civil Engineering and in the UNESCO Associated School No. 639. About 200 students attended the first presentation. The director and teachers of the College demonstrated great interest in cooperation with the University of Maribor. They invited the Slovenian colleagues to take part in the Congress in the spring of 2017 and continue further discussions on cooperation. About 100 pupils attended the presentation in the UNESCO Associated School No. 639, which is among the elite secondary schools of St. Petersburg. Many of them showed great interest in education in Slovenia, because they pay special attention to the study of foreign languages, computer science, physics, chemistry and mathematics. The administration of the educational institution expressed its willingness to cooperate and to conduct detailed discussions with the representatives of the Faculty of Civil Engineering, Transport Engineering and Architecture and other faculties of the University of Maribor. The teachers and the management of Russian gymnasiums and schools as a whole reacted positively to the prospect of cooperation with the Slovenian university. A visit to the Peoples’ Friendship University of Russia on 1 November 2016 was held in a warm and welcoming atmosphere. Following the meeting, the sides noted a high potential and good opportunities for cooperation in the field of both pedagogical activity (exchange of teachers and students, for example, through the Erasmus+ program, the arrangement of joint summer/winter schools, the organization of joint training programs, etc. ), and project work (cooperation in the preparation and submission of projects). The Russian side expressed interest in cooperation with both the Faculty of Civil Engineering, Transport Engineering and Architecture and the University of Maribor as a whole. The representatives of both sides started preparing a draft of the Russian-Slovenian cooperation agreement between universities. Since 1994 the “Education and Career” Fair has been traditionally held in Moscow twice a year (spring and autumn). It is the largest event in the field of education in Russia, which is visited by pupils, students, teachers, (tourist) agencies that are engaged in the education abroad, education consultants, journalists, and officials. About 23,000 prospective students and their parents visited this Fair. More than 1/3 of them are guided to study abroad. The services were provided by 300 schools, both from Russia and abroad (among them—the Faculty of Civil Engineering, Transport Engineering and Architecture of the University of Maribor together with the 2TM Company). Many Russian schools are interested in finding new foreign educational institutions-partners and in the future long-term cooperation with them. The Fair is a unique opportunity to establish and strengthen relations between Russian scientific schools, institutes and famous universities and their colleagues and partners from around the world. Schoolchildren, students and their parents are interested, above all, in the information-packed part of the scientific process (study programs, educational process, involvement of the University of Maribor in the European and international educational organizations, etc. ), in the cooperation with the economy sector and the prospects for further employment in the field of architecture, civil engineering and transportation. 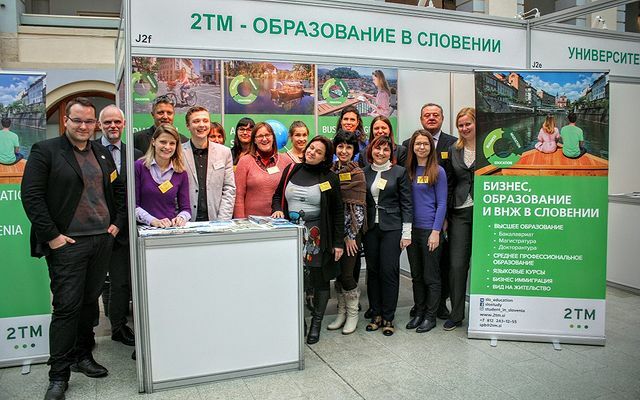 The international educational events in Moscow and St. Petersburg have shown that Russian students have great interest in studying at the Faculty of Civil Engineering, Transport Engineering and Architecture of the University of Maribor. As compared to other European universities, the University of Maribor has competitive advantages: relatively low tuition fees and inexpensive living together with the high quality of education. In addition, the Maribor University diploma is officially recognized throughout the EU. These events were organized by the Faculty of Civil Engineering, Transport Engineering and Architecture of the University of Maribor and the 2TM Company (Ljubljana).